My collection is quite a bit bigger than the norm, so my storage problems are probably worse than the the typical fan or collector will encounter. 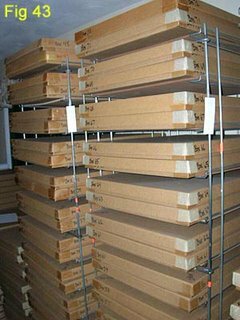 In any case, I thought you might be interested in how I store my collection. Beyond the bagging and the boxing, if you just store your collection in any old nook and cranny you'll have trouble tracking the stuff down when it's time to reread or sell. I keep track of all my daily runs, and most of my Sundays, with a database. I use an older version of Paradox because I'm comfortable with it, but any decent database program will do just fine for tracking a collection. For dailies I track pretty much the same information as I write on the bag labels (title, date range, count, and source paper), plus I add the size (in newspaper columns), what I paid for it, and any notes about the run, including condition if there are any problems. For Sundays I track the title of each strip, the date, the newspaper, the format (full, half, third, tab, etc. ), number of colors (in case the sheet is not printed in full four color), the topper strip if there is one, condition problems if there are any, and the strip title that appears on the reverse. I include that last piece of information because I regularly resell Sundays and I want to make sure that I don't resell a strip that has something rare on the reverse, or offer to sell a minor strip for a couple dollars only to find that there's something very valuable on the other side. In both my Sunday and daily databases I have an additional field that tells me where the given item is stored. As you have seen, I store my Sundays in the boxes described yesterday. On each box I simply write a unique number, then as I buy Sunday tearsheets and put them in the current box I'm filling, I add the Sundays to the database with that box number referenced. Then if I need to retrieve a Sunday I just have one box to check. You may not like this system because you end up with boxes that contain a mish-mosh of material. And that's certainly going to be the case. Every one of my boxes contains a miscellany of material, usually with something from every decade of the previous century, all rubbing elbows with each other. But I'm okay with this because it would be a huge job to try to keep all of a given title or even era or genre together. 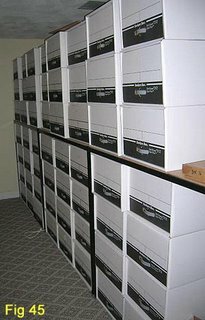 In fact, I once tried to do exactly that when I started collecting Sundays, but it became apparent quickly that I could end up spending all my time just doing the drudge work of categorizing and filing material into a vast array of boxes. And it really would be an impossible task, anyway. If you keep a box for your Terry And The Pirates, say, and another box for your Steve Canyons, what do you do when you get a batch of tearsheets that have the two strip together? And if you think the chances of that are awfully slim, let me pass on to you Allan's Rule of Sundays - Sundays of a Feather Flock Together; in other words, junk gets backed with junk, and the rare and collectible get backed with the rare and collectible. It's a rule with exceptions, but it's pretty damnably and eerily accurate. In figures 43 and 44 you see my Sunday storage boxes all snug in their storage area. I used to just stack the boxes up on top of each other in a big pile, but that was a real pain when I had to get at a box a dozen down from the top of the stack. Luckily I found a storage system that is absolutely perfect, and, believe it or not, absolutely free! These are bakery tray carts from the supermarket. I happened to find several of them out for the garbage behind a local grocery store and immediately saw their potential. You see, where each of the bakery racks can slide on to the cart, I instead can slide a stack of two of my boxes. The typical cart can hold about 30 boxes, and as a further bonus they have wheels so you can move your entire collection at a moment's notice. Now before anyone accuses me of stealing bakery carts, I swear to you that these were out at the grocery store's dumpster ready to be hauled away. Why I don't know, other than that some were slightly banged up, and some had sticky wheels (fixed in a jiffy with some WD-40). Since my first discovery of the bakery carts, I keep my eyes peeled and am amazed at how often a cart or two is out at the dumpster. What are those people doing to their bakery carts? Dailies I keep in banker's boxes; the ones that have a drawer that pulls out the front. I recommend somewhat smaller boxes then the ones I use unless you have a really big collection. With the quantity I store, though, the big boxes are more practical. 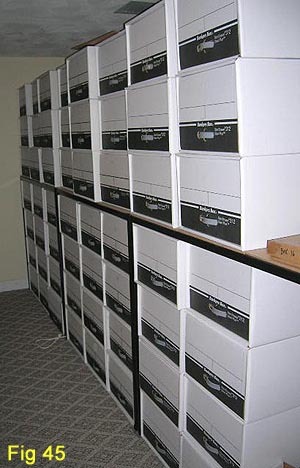 Just like I do with the Sunday boxes, I number the banker's boxes and record that number in my database of daily strip runs for all the dailies that go in that box. Again as with Sundays, I don't really try to keep particular titles together in these boxes. I just fill them as I buy material, whatever it might be. 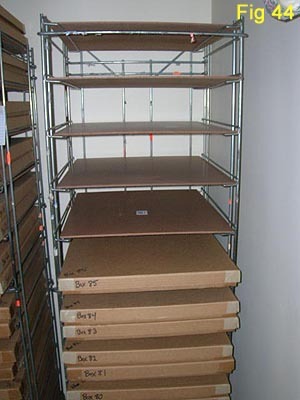 Figure 45 shows the storage area for my dailies, 46 shows one of the boxes. The shelving units are necessary because these banker's boxes are not sturdy enough to be stacked more than four high. 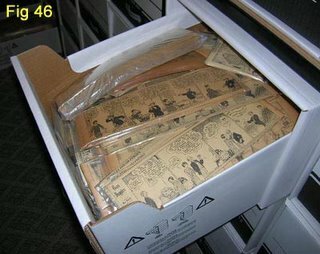 And that's the end of my rather extended series on storing a comic strip tearsheet collection. Hope you've enjoyed it! Sorry T, I don't do appraisals. You can figure out the value of most anything these days by watching for similar stuff on eBay for awhile.